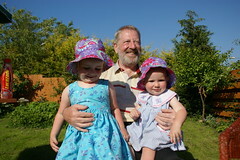 The funeral of my father-in-law, Dougie, took place today. 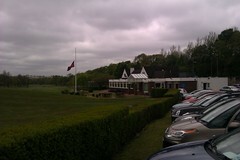 Afterwards we went for refreshments at Cowglen Golf Club, where Dougie spent a very large part of his retirement, and the club had therefore put the flag at half mast in his honour. There were lots of people at both events, as was fitting for a man as popular as Dougie. In spite of the horrendous weather, I think the day was a beautiful tribute to the man and his life. 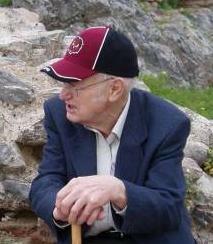 My father-in-law, Douglas (Dougie) Buchanan, passed away in the afternoon last Friday, the 11th of May. He had been diagnosed with cancer a year and a half ago and told he only had a few months to live, so making it past his 69th birthday was quite an achievement! Even so, we didn’t expect his death so soon. He was out playing golf less than two months ago, and the scans were good, so we had hoped he might have stayed around a little longer. In the end, it was a stomach ulcer combined with a chest infection that proved too big an obstacle for Dougie, and he spent the last few weeks in Hairmyres Hospital (where parts of Ninety Eighty-Four was written). I’ll miss him. Apart from being a loving grandfather (“Pumpa”) to my children, he was a fellow blogger, and like me, he was passionately in favour of Scottish Independence, proudly wearing the “Independence 2014” wristband I gave him until he went into hospital. One of the last things he said was that something needed to be done about BBC’s bias. I wish he had managed to hang on until the Independence referendum — he would have been so keen to go and vote Yes! He was always very helpful — we have put down a good number of laminate floors together, and he and Ann (his wife and my mother-in-law) wallpapered many of our rooms. He was also very good company and a great host. He will be sorely missed by all of us. It was announced today that Dennis M. Ritchie – the ‘R’ in ‘K&R’ – has died. Although it has been mentioned in some mainstream news sources, it hasn’t exactly generated the same amount of reactions as the death of Steve Jobs. However, I believe dmr was probably more important in the development of modern computers. I’m sure many people read in the obituaries that he was the co-inventor of C and Unix and then just shrugged their shoulders. However, the importance of those inventions can hardly be overstated. C is one of the most successful programming languages of all time, and it lives on as a subset of its successor languages, C++, C# and Objective-C (apart from the number of languages that have been inspired by C, such as Java, Perl and PHP). Most users might not realise it, but the vast majority of iPhone apps are written in Objective-C, just to take one example. Unix is probably the most important and influential operating system ever. 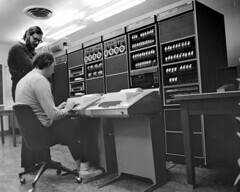 Lots of modern operating systems, such as Linux and Mac OS X, are practically speaking modern varieties of Unix, and iPhones, iPads and Android phones are basically portable Unix computers. Of course both C and Unix were team efforts, but there’s no doubt that dmr played a crucial role in the development of both. His memory will live on for a very long time. I bought my first Mac in 1990, an SE 4/40. At that time, Steve Jobs had already been away from Apple for five years, and the company was alternating between successes and disasters. By the time this computer needed replacing, Linux 1.0 had just been replaced, and I enthusiastically embraced the Linux world and put Apple behind me. 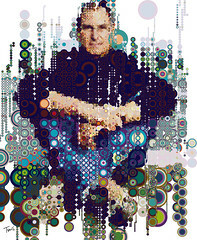 A few years later, Steve Jobs returned to Apple and eventually managed to turn the Macintosh into a useful computer again (the operating system had been getting slower and less stable starting with System 7 in 1991), but for a long time, the Mac seemed to appeal mainly to die-hard Apple fanboys – I was certainly never tempted to return to the fold, and my impression was that Apple was largely ignored by most people. That changed with the introduction of the iPod and later the iPhone, both of which got huge followings. I’m convinced many modern Macintosh users only ditched their Windows computers because the iPod and iPhone had decontaminated the Apple brand. However, I never really become a fan of Apple again – although I have an iPod Touch and a Mac Mini, I feel more attached to my Android phone and my Linux box. I wonder what Steve Jobs will be remembered for in the longer term. My guess is that he won’t be seen as a great innovator, but rather as somebody who could spot the technologies that had the potential to appeal to non-techies. The Macintosh demonstrated that end-users liked graphical user interfaces, and Microsoft then created Windows; the iPod showed that people were ready for MP3 players; and the iPhone led the way in making people switch from ordinary mobile phones to smartphones. Jeg opdagede først i dag, at Hans H. Ørberg afgik ved døden den 17. februar i år, 89 år gammel. Han var forfatter til det fantastiske latinkursus Lingua Latina per se illustrata, som formår at lære den interesserede elev latin uden at bruge andre sprog end latin overhovedet. Denne måde at skrive sprogkurser på (“Naturmetoden”) var ikke Ørbergs egen opfindelse (se nedenfor), men han forfinede den og holdt fast i den, da den ellers var ved at gå i glemmebogen. Arthur M. Jensen er idémanden bag naturmetoden især inspireret af Otto Jespersen og den ‘direkte metode’, men han har mig bekendt aldrig skrevet noget om den teoretiske baggrund for metoden – selv henviste han altid til sit forord til det engelske (og franske) kursus. Han har heller ikke selv formået at praktisere metoden i synderlig grad, for hans forfatterskab indskrænker sig vistnok til de indledende, temmelig indholdsløse kapitler af ‘Engelsk efter Naturmetoden’, resten er, så vidt jeg véd, skrevet af hans datter Thurid Grièse (og hendes mand?) og for en del af Knud Schibsbye; det franske kursus er skrevet af Oleg Koefoed (bortset fra kap. 1-8, som Thurid Grièse har ansvaret for), og det italienske og russiske kursus er helt igennem skrevet af Oleg Koefoed. Alligevel står Arthur M. Jensen som forfatter på titelbladet! Det ønskede han også på det latinske kursus, som han knap nok har gennemlæst, men det protesterede jeg imod. Da jeg forelagde ham mit første udkast i 1952 foreslog jeg titlen ‘Lingua Latina per se illustrata’, men det blev afvist til fordel for ‘Lingua Latina secundum naturae rationem explicata’ (ordet ‘naturmetoden’ skulle indgå i titlen). Arthur M. Jensen var først og fremmest forretningsmand og hans virksomhed ‘The Nature Method Institutes’ havde stor succes i mange europæiske lande, hovedsagelig med det engelske kursus. Jeg var fast medarbejder 1952-61 med den opgave at skrive kursus i latin. Da det var helt færdigt i 1957, arbejdede jeg med metodisk kontrol af Oleg Koefoeds italienske og russiske kursus foruden med følgemateriale til og revision af det latinske. I 1961 søgte jeg tilbage til gymnasieskolen (Ordrup Gymnasium) og kom i 1963 til Grenå. Herfra samarbejdede jeg med Erik Hoder og Knud Schibsbye om en tiltrængt revision af det engelske kursus, som ikke nåede at blive gennemført. Arthur M. Jensen døde i slutningen af 60’erne og virksomheden blev først videre af hans yngre kompagnon Erik Hoder, som længe havde været den egentlige leder. Erik Hoder døde i 1975, og derefter gik det rask tilbage for virksomheden, som helt ophørte i løbet af 80’erne. Derfor kan man nok ikke få naturmetodekurserne i de moderne sprog idag (især det italienske kursus er fortrinligt). Som det ses, var der ikke skrevet meget lingvistisk om metoden, så jeg opgav at skrive speciale om den. Lige siden har jeg dog ment, at det er en stor fejl, der ikke findes Naturmetode-kurser i alle sprog. Jeg brugte selv et tilsvarende kursus til at lære esperanto med, “Esperanto la? Naturmetodo/Esperanto la? Metodo Friis” (den anden titel blev vist taget i brug, da Friis opdagede, han ikke han lov til at bruge varemærket “Naturmetoden”), og det var også fremragende. Hans H. Ørberg er nok død, men hans værk vil leve i meget lang tid! Author thomasPosted on 2010/10/05 2012/11/20 Categories da, featured, linguistics, obituary6 Comments on Vale, Hans H. Ørberg! I’m sorry to read that El Bulli will close down. Given that it’s been rated the world’s best restaurant for several years, I’ve always had a desire to go there, but I had to contend myself with a book about it Phyllis gave me for Christmas two years ago. I guess it was inevitable, though. That type of innovative cuisine can’t stay at the top forever, so they had to choose between slipping down the rankings at some point, or closing while they were still at the top. Hopefully the academy they’re creating instead will eventually lead to even better restaurants.